Stephen is a UK ARB registered architect. Stephen is a practising project architect who also spends a lot of time sharing practical knowledge gained from live projects. Until November 2011, Stephen was the Curriculum Advisor for SusCon - a leading training centre in sustainable construction providing an innovative programme of activities to enable existing and future employees in construction to have the appropriate skills to meet the demands of sustainable construction and enabling SMEs to be ready and able to take up opportunities within the green economy, including new environmental technologies as they arise across the South East. Stephen left to set up AfC in Sydney. Stephen also established a 'Knowledge Exchange' partnership with the Masters programme and the practice where he works, particularly related to the Government's 'Retrofit for the Future' challenge. Until March 2011, Stephen was an Associate at Broadway Malyan Architects - a multi-disciplinary design practice where he furthered his experience in ecological building design and environmentally-driven masterplanning. Stephen adopted a unique role in the practice, positioned between the in-house environmental engineers and the practice's town-planning consultants, to promote deliverable sustainable development with wide agendas at several scales, ranging from innovative individual domestic eco-retrofits to masterplanning that integrates low energy, water neutral and managed waste infrastructure. Stephen completed his MA at UEL in 2008 with distinction; his thesis was titled: "How can new neighbourhood developments contribute to UK CO2 reductions?" His dissertation set out to discover how practical design, management and planning processes can be applied to enable sustainable fuel consumption within new residential development in the United Kingdom to reduce CO2 emissions. 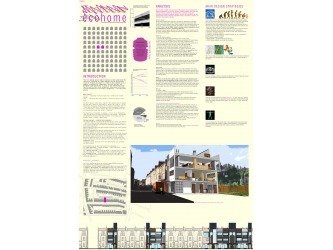 This is carried out through the investigation of current energy scenarios and the critical appraisal of built case studies throughout Northern Europe, focusing particularly on a scale of development that is currently not adequately covered or guided by legislation, namely the ‘neighbourhood scale’ -- greater than the single home, but smaller than a brand new self-contained town. 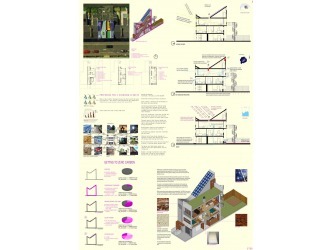 Stephen was highly commended by the Jury at the Concrete Centre's 'EcoHouse Competition 2008'. 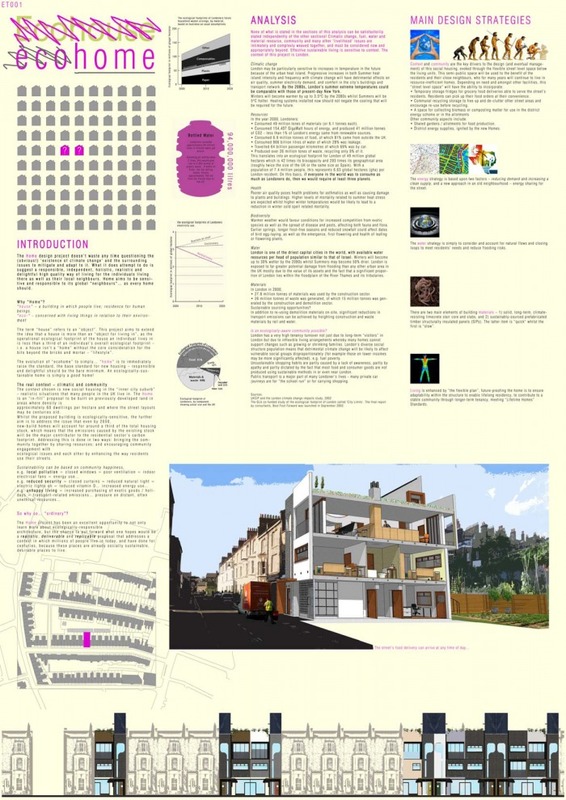 "The project aims to extend the idea that a house is more than just an 'object for living in' as the house alone accounts for only one third of the ecological footprint of each individual, we must also consider lifestyle where all actions are considered. Located in an inner city suburb, the proposal is for infill terraced units to produce a realistic deliverable and replicable home that meets with a popular form of living. Design strategies address the heat, soil and water. Limecrete is used for wall elements and floors as a slower but less damaging process using local labour materials. 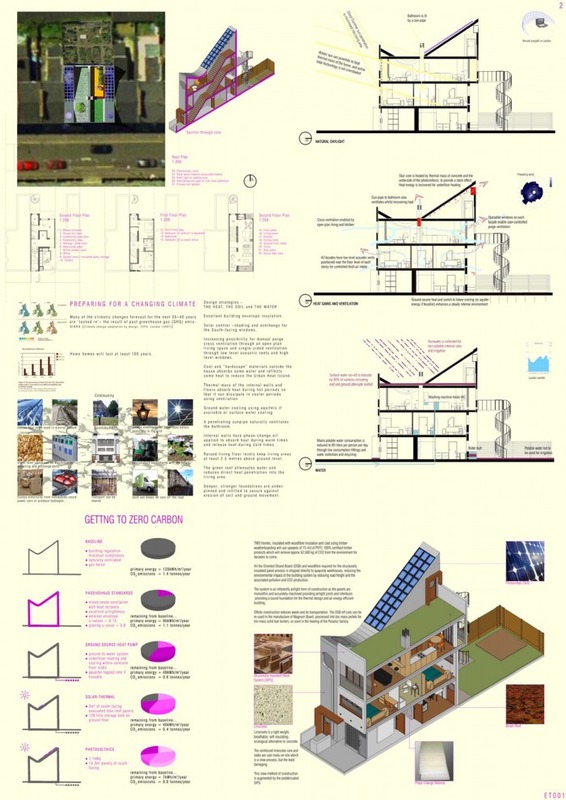 'Zero carbon' strategies used include building to passiv haus standards of u values and airtightness, use of ground source heat pumps with ground to water transfer, underfloor heating and cooling within concrete slabs, the adoption of solar energy from evacuated tube roof panels and pv panels on the south facing roof slope." The decision to work from an existing street pattern and house type has not proved to be a restriction to the imagination of the designers. The use of passive and active lower energy techniques has demonstrated the continued benefits of the terraced dwelling. The entry contains a wealth of supporting information.